The 35 must-watch technologies represented on the Gartner Inc. Hype Cycle for Emerging Technologies, 2018 revealed five distinct emerging technology trends that will blur the lines between humans and machines. Emerging technologies, such as artificial intelligence (AI), play a critical role in enabling companies to be ubiquitous, always available, and connected to business ecosystems to survive in the near future. 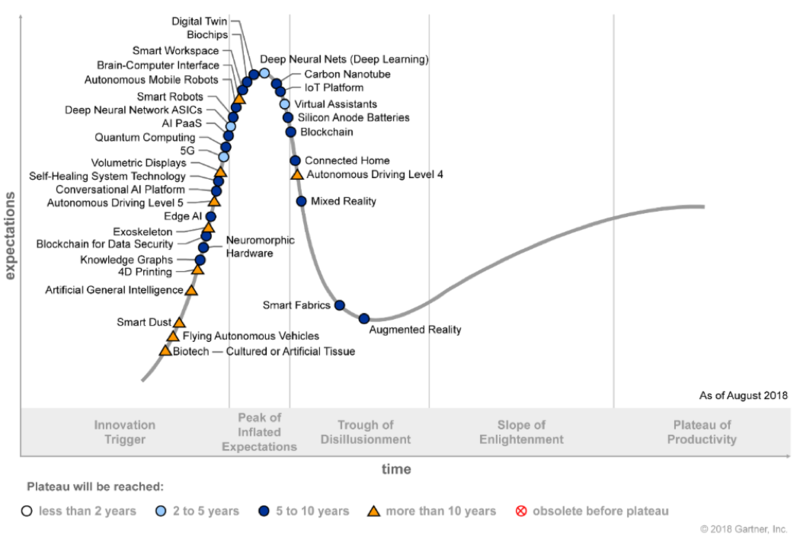 The Hype Cycle for Emerging Technologies is unique among most Gartner Hype Cycles because it garners insights from more than 2,000 technologies into a succinct set of 35 emerging technologies and trends. This Hype Cycle specifically focuses on the set of technologies that is showing promise in delivering a high degree of competitive advantage over the next five to 10 years (see Figure 1). AI technologies will be virtually everywhere over the next 10 years. While these technologies enable early adopters to adapt to new situations and solve problems that have not been encountered previously, these technologies will become available to the masses — democratized. Movements and trends like cloud computing, the “maker” community and open source will eventually propel AI into everyone’s hands. Emerging technologies require revolutionizing the enabling foundations that provide the volume of data needed, advanced compute power and ubiquity-enabling ecosystems. The shift from compartmentalized technical infrastructure to ecosystem-enabling platforms is laying the foundations for entirely new business models that are forming the bridge between humans and technology. Infrastructure is no longer in the way of obtaining an organization’s goals. The advent and mass popularity of cloud computing and its many variations have enabled an always-on, available and limitless infrastructure compute environment. Gartner clients can read more in the report “Hype Cycle for Emerging Technologies, 2018.” This research is part of the Gartner Trend Insight Report, "2018 Hype Cycles: Riding the Innovation Wave". With profiles of technologies, services and disciplines spanning over 100 Hype Cycles, this Trend Insight Report is designed to help CIOs and IT leaders respond to the opportunities and threats affecting their businesses, take the lead in technology-enabled business innovations and help their organizations define an effective digital business strategy. Additional analysis on emerging technologies will be presented during Gartner Symposium/ITxpo, the world's most important gathering of CIOs and other senior IT executives. IT executives rely on these events to gain insight into how their organizations can use IT to overcome business challenges and improve operational efficiency. Follow news and updates from the events on Twitter using #GartnerSYM.